Ken Stone has been in the storage business for more than three decades. If anyone knows stuff about stuff, it’s Ken. Since the merger of Patterson Business Systems and J.E. Pope in 2004 (effectively creating “Patterson Pope”), Stone has found a niche working with military clients. 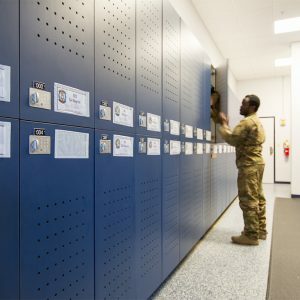 After 15 years of nurturing those relationships, he has a very good handle on the state of storage in the military. Q: How did you come to focus so heavily on military clients? A: I can trace it to the beginning of Patterson Pope’s association with Spacesaver. 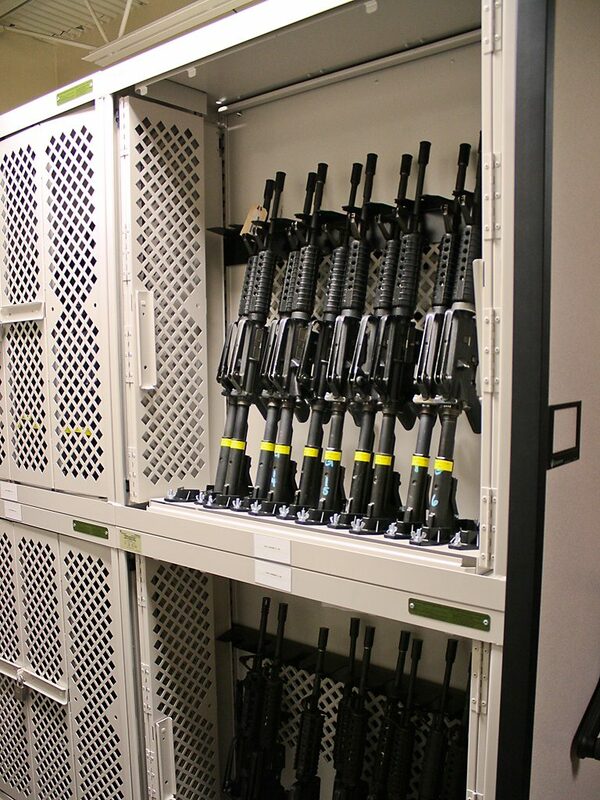 At the time, Spacesaver had a relatively new product in their weapons rack. 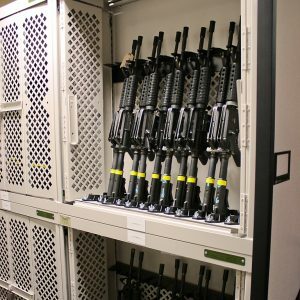 When I started calling on military bases – Camp Lejeune and Fort Bragg specifically – the innovations offered in the weapons racks were in high demand. Q: What made the Spacesaver weapons racks so appealing? A: The same things that made them popular then still make them popular today. First and foremost is their incredible flexibility. 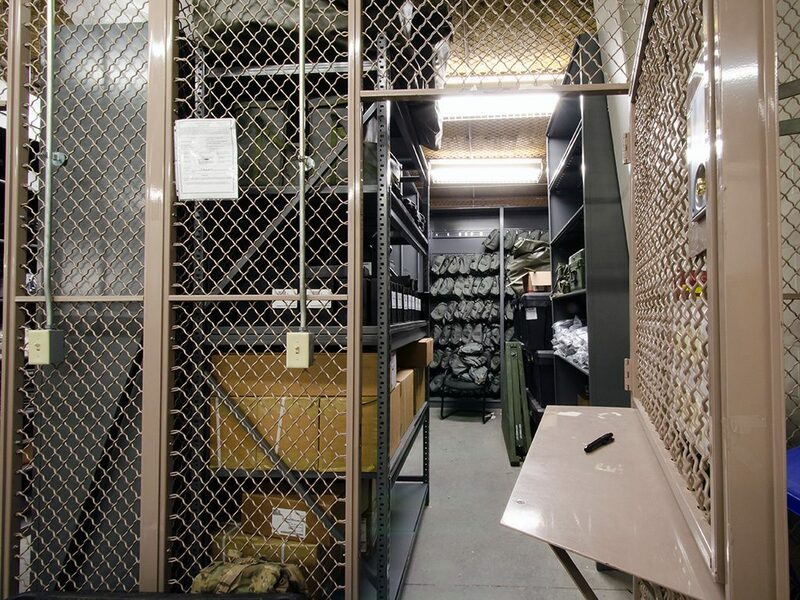 The racks the military had used up until then – say 2004 – became obsolete when soldiers switched from using M-16s to M4s. With older storage options, they simply couldn’t secure their weapons because the older units weren’t adjustable. It was impossible to use them with the newer weapons. But Spacesaver’s units are customizable. It used to be you just had a rifle with a scope/sight on it. Now they have all this extra stuff they call SOPMOD, all this extra gear on the rifle that makes it bulkier. A Spacesaver rack allows you more flexibility. Security is number two. They are able to be padlocked with bi-fold doors. And I’d say quality for sure is number three. So, it’s a combination of quality, security, and flexibility. 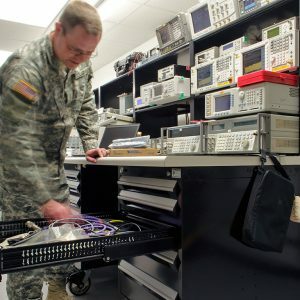 Q: What is unique about working with the military? A: There are a lot of things that make the military unique. Chief among them, though, is the reality of change. Over the last 15 years, probably about 75 percent of my work has been with the military. If I had 10 military projects going, eight of them were for weapons racks. Now, it’s probably the reverse. The other thing about the nature of change in the military is that, generally, few individuals stay in the same job for more than two years. Sometimes no more than 12 months. That makes building solid relationships both a little more difficult and that much more important. 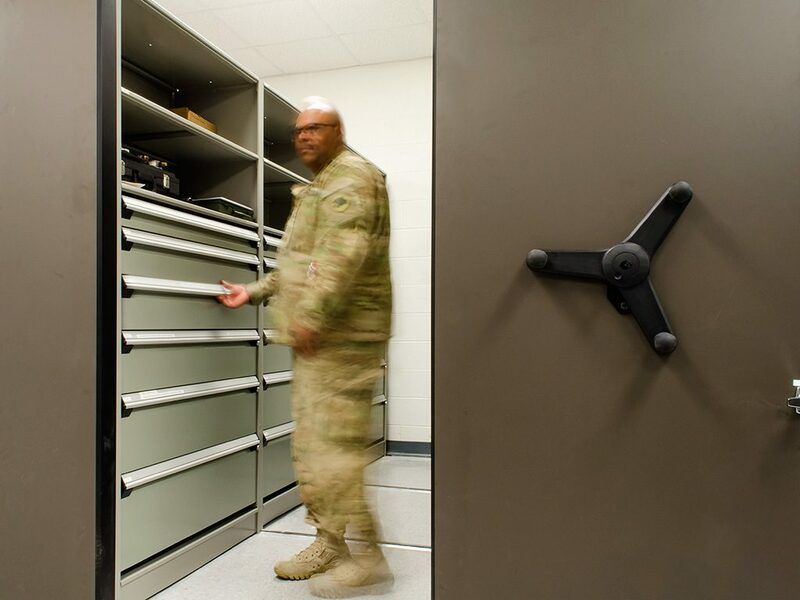 Q: What does all that movement of personnel mean as it relates to storage projects? A: You’ll start a project with a lot of people and then they’re not around to see it through. Or, you go in there and sell a big project, then walk in there the next year and the person you meet with doesn’t even know who you are. So you have to re-create yourself all the time. The other aspect of change is that the military’s fiscal year runs from October 1st thru September 30th. If you don’t get a project signed off in those 12 months, the whole process has to start again, often with new people new budgets and sometimes, new expectations. It’s challenging. 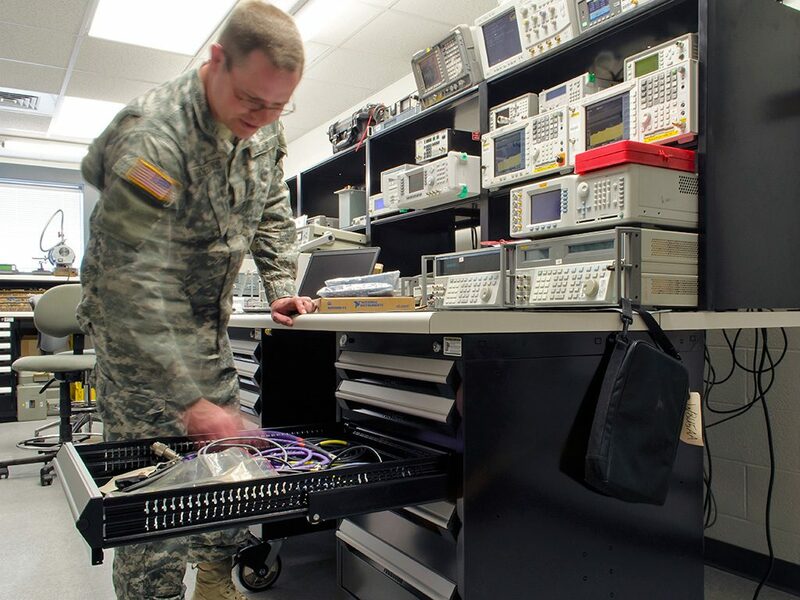 Q: What is most important for someone in the military to think about if they’re considering a new storage project? A: We just talked about how much things change in the military. There might very well be those people who come in who have different ideas about how to organize something. I want to be able to give them equipment that accommodates changes in viewpoint. Look, precision counts because money is usually allotted very precisely, too. With the client’s input, we try to design long-term solutions that are both durable and flexible. That’s why I always try to design things that are modular. If their needs change or their ideas change, or their personnel changes and the new people have new ideas, they need to be able to reconfigure their setup to their liking. If they want to change shelving configurations, they can. What’s important is that the bones of the system are there. Spacesaver, for the most part, has that same philosophy. 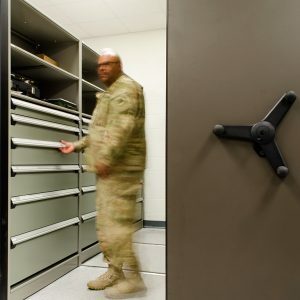 They try to make a lot of their military storage products interchangeable and modular in design. 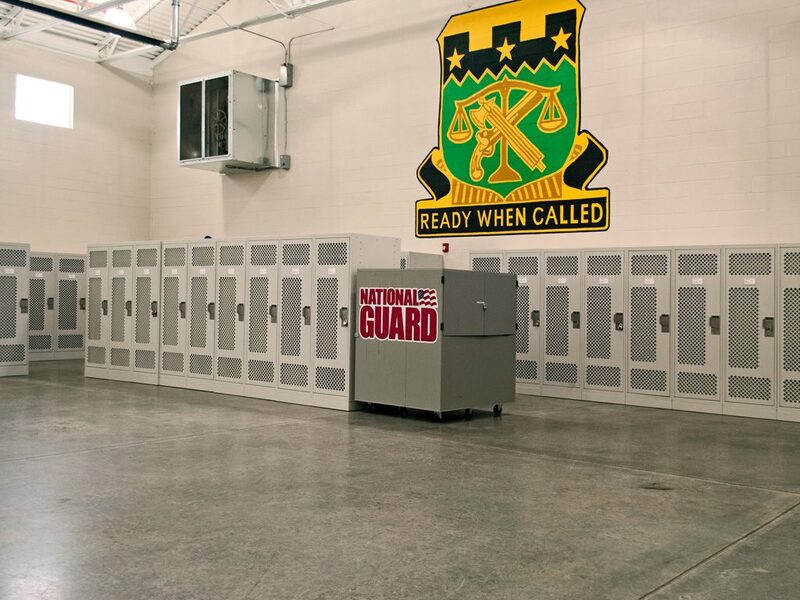 Q: Aside from weapons racks, what are some other products that have special application for military clients? 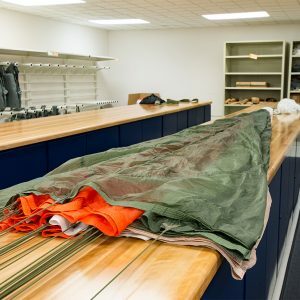 A: We like to think of ourselves as the para-rigging outfitters. We tried to create a niche for storing parachutes. We have parachute containers that Spacesaver manufactures for storing and shipping large quantities of parachutes. We also offer hanging racks for storing Halo chutes. Both of those can be on mobile if the client so chooses. 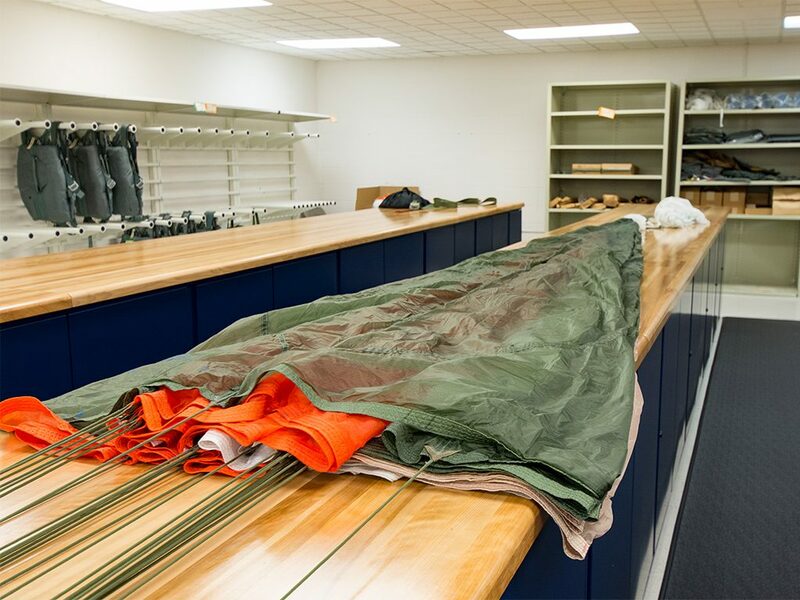 We’ve also gotten into selling packing tables (roughly 40’ long) that are used to fold parachutes. Those are largely from Rousseau. We’ve also done some Spacesaver 4-post with some wooden tops as well. Sometimes we even put them on Spacesaver carriages so they can slide them to one side of the room or the other. Outside of that, it’s just selling a lot of shelving for a lot of different things. A military base is like a small city. 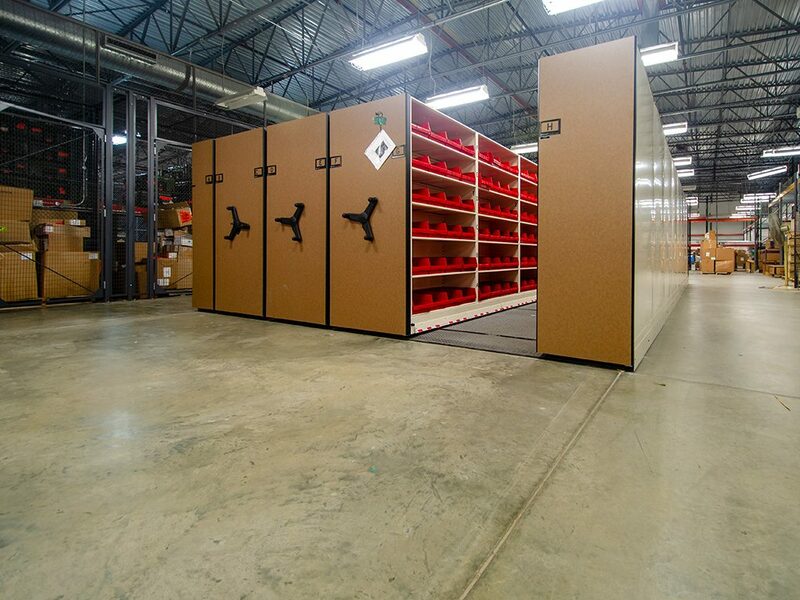 There are all sorts of storage needs, from medical supplies to gas masks to storage for food items in the cafeteria. In the military, like in other industries, better organization and accountability are important. 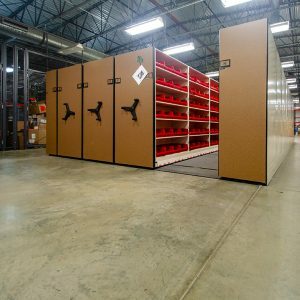 Q: What about storage cages? Don’t a lot of military bases have those? A: The three most common are supplies, communication, and CBRN. A lot of times, outposts’ existing cages are outfitted with a makeshift collection of storage equipment. We’re able to come in there and help standardize the look, make it user-friendly and provide better organization. 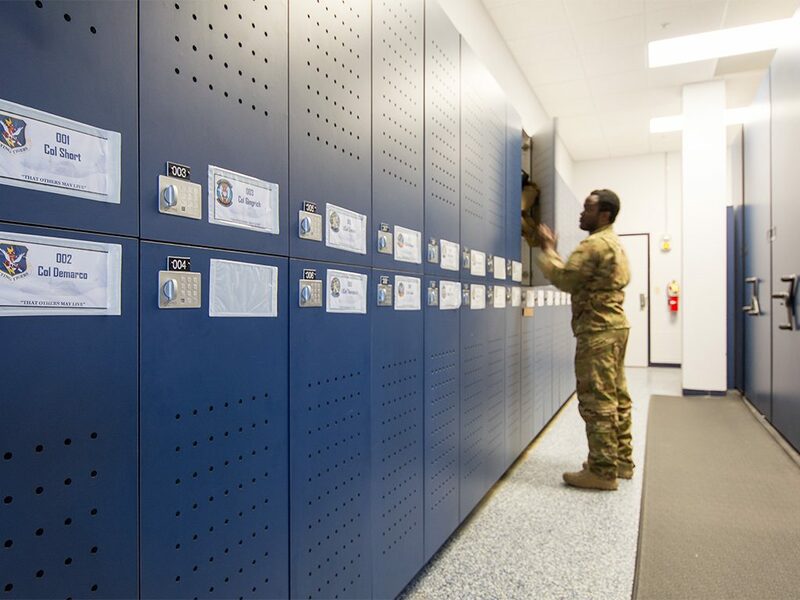 Whether the change is inspired by a failed inspection or because the soldier in charge is just very organized, it’s a great opportunity to modernize a very valuable aspect of their storage requirements. Q: Are there special challenges to working with military clients? A: I love working with them. They’re just good men and women serving their country. They do a lot of interesting things, and they always have more than a few interesting stories to tell. Helping them solve their challenges is really something that drives me. 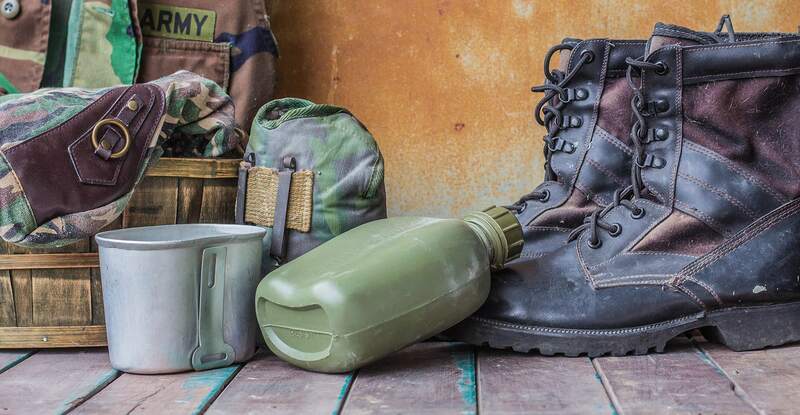 While the procurement process in the military is a bit different, it’s not something that can’t be accommodated with a little effort and a lot of perseverance. Dealing with different individuals in different roles with sometimes competing priorities and resources can be a little extra challenging, but it’s always worth sticking with it. While the procurement process in the military can be frustratingly unpredictable, it’s always worth it in the end. 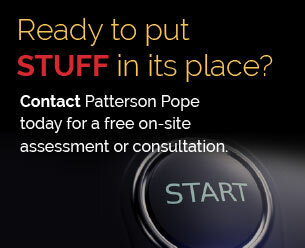 Q: What should potential military clients know about Patterson Pope’s ability to help them? A: The military is hard on stuff. 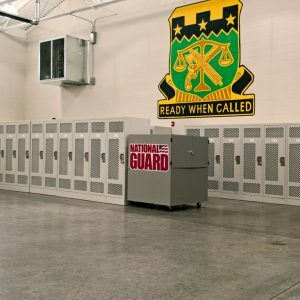 So it benefits them to have the highest quality military storage equipment to ensure that it’s durable. We sell value – value in the product, value in our people and value in our work and commitment. At Patterson Pope, we’ve always been lucky enough to have the opportunity to represent the best manufacturers in the business. We offer an assortment that includes not only Spacesaver but Rousseau and Hamilton Casework Solutions as just three examples. We sell quality and value. When you invest in quality gear, you don’t have to worry about problems that might crop up down the line. Q: What is the biggest stuff problem that the military has these days? A: Their biggest problem is that they still have a lot of outdated military storage equipment and they have a lot of piecemeal stuff. They’re moving people around all the time.. And when they move, someone else moves in behind them, often with different requirements. And then they have different requirements. It’s a constant cycle. I’ve done enough work with the military now where I can say, “Let me show you what we typically do in these situations,” and then give them exactly what they need. 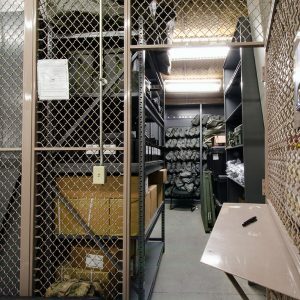 Let’s say somebody from a military unit is thinking about doing something storage-wise. No matter what project they’re thinking about doing, what are some of the things they should be thinking about? My number one thing is to design something that’s flexible and modular so that it can be changed or reorganized as their needs change. 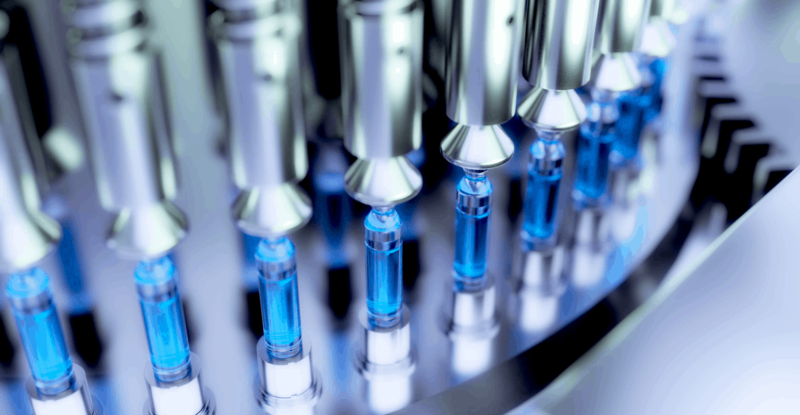 While change is constant, so is our commitment to delivering quality products and a quality experience.